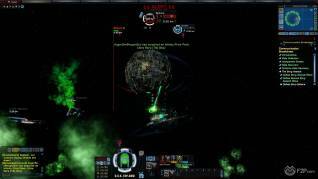 During this past weekend we took out some hours to check out free to play sci-fi MMORPG Star Trek Online. 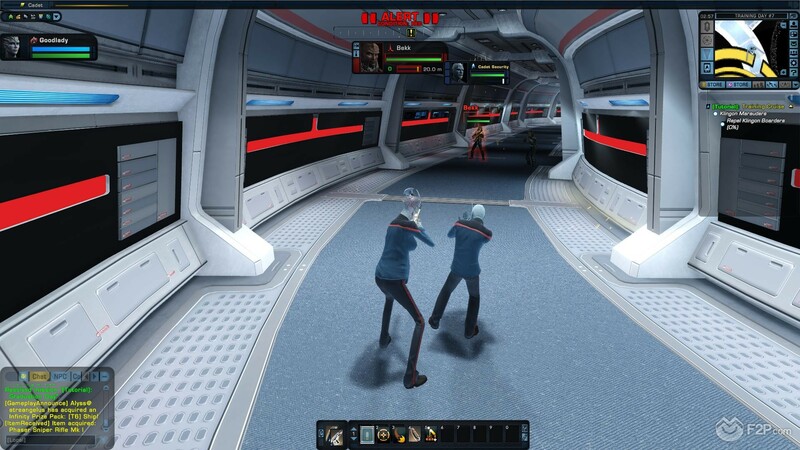 Obviously set in the Star Trek franchise, we were excited to get our hands on the game (even though it’s been around for seven years now) for our own play through as new players to see just what it was all about. 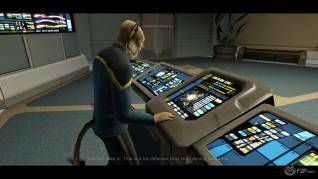 On our free account our experience began with the character creation screen, a pretty impressive start with the huge number of available classic alien races that could be customized with a whole bunch of buttons and sliders. 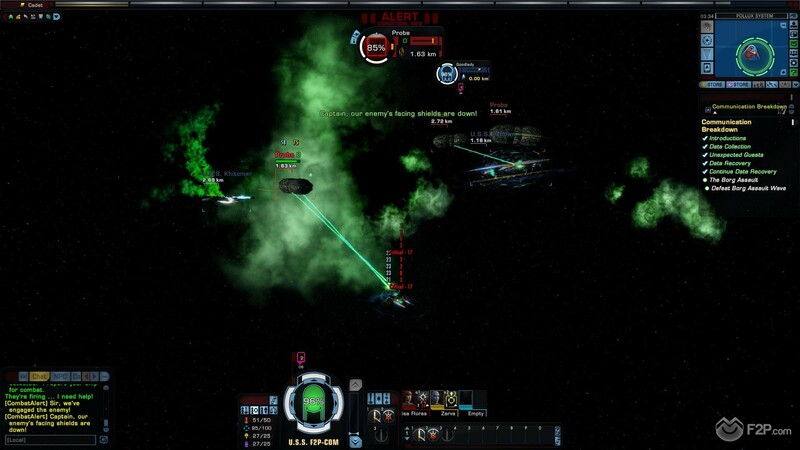 One of the things we always loved about Star Trek was the sheer variety of characters and species, and the developers have done a good job of recreating that providing dozens of cannon races divided into the three playable factions: Romulan, Klingon and Federation that made sense to the franchises lore. 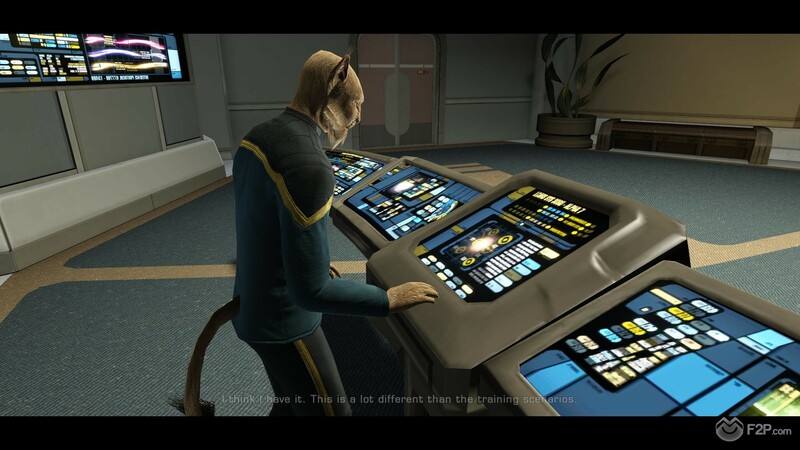 Whilst the game does cover a lot of the races there’s also a generic “Alien” as part of the Federation which gives players a lot more freedom to create new humanoid species, or potentially recreate those seen in the show that the developers might not have officially put in. We were able to make a pretty hideous looking character with the options available (as we always do when we have the opportunity) and chose the Tactical Officer as our class, with Medical and Science being the other two options. Character created we found ourselves on Earth at the Federation Academy, freshly graduated we were waiting to get our assignment, running around talking to other students on graduation day, it was quite a slow but very appealing start to the game that emulated the Star Trek shows and movies really well. The environments were captured perfectly, and whilst the older graphics might show in places, the detail that has been put into each area creates a very immersive experience that is further enhanced by voiced NPCs and snappy dialogue. Through the early tutorial we were assigned to a ship and found ourselves in the position of First Officer, however, knowing that the game revolves around you Captaining your own ship it was interesting to see how the story would unfurl to put us in that position. 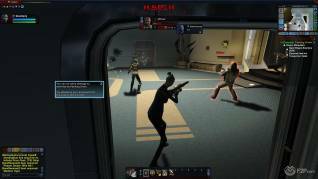 Out on our first mission it wasn’t long before we found ourselves the victims of a Klingon ambush, with the three playable factions being in a state of aggression in this alternate timeline; our attackers boarded our ship and we were tasked with grabbing a phaser rifle and hunting them down! 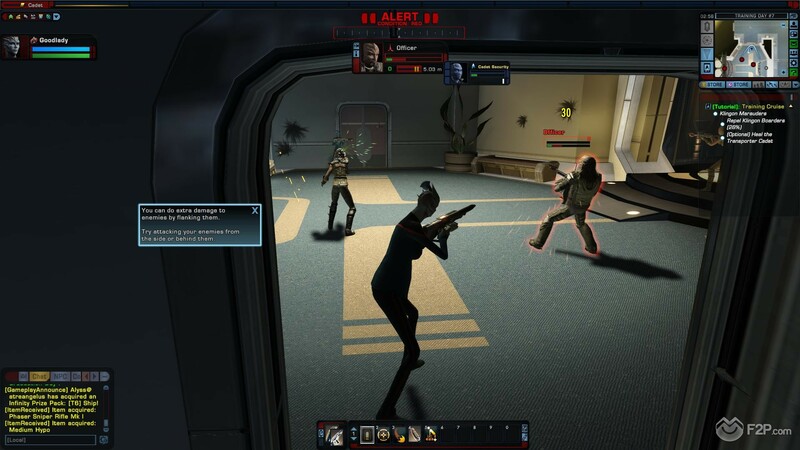 Running around the ship was fun, collecting crewmates who would arm themselves and follow us to repel the attackers, story wise and cinematically it was very fun; however the combat itself was pretty awful. The “ground combat” is third person and consist of a point and click attack with a variety of moves you can perform on your hotkeys, but the movement just feels extremely clunky and at times hard to position your camera, or if you take cover it’s hard to tell why you can’t target and attack someone even though you have a clear line of sight to them and might be able to attack the person next to them. 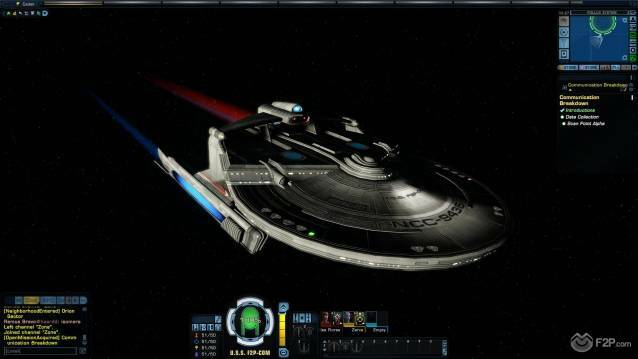 Battling through the ship was still fun, and our choice of class played into what missions we had to do, which was a nice addition. Without giving away spoilers the main portion of our tutorial ended with us personally taking command of the ship and sitting down in the Captain’s chair; though where the tutorial officially ends is hard to say as it then transitions into the next scene where we’re directly controlling the ship in space. 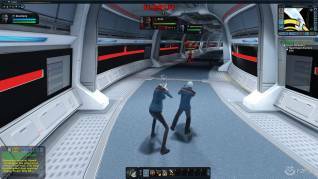 Navigating our way through space, or across different regions using the sector map, we were now on the hunt for our Klingon attackers! 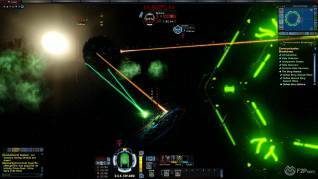 Space movement, and ultimately combat, feels a lot more fluid than ground combat; given that space combat was the main combat element in the original release (with ground combat revamp being made a year later in Season 4 it does feel like a tacked on feature that never really got the same polish that space combat did). In space you have 360 degree movement using WASD, however the ship always lines out horizontally with W and S controlling the vertical movement, so you can’t flip your ship upside down. What does matter is positioning as our ship had front, rear, starboard and portside shields that all had individual hitpoints, as well as our weapons having different firing arcs (such as requiring our target to be in front of us to fire off our photon torpedoes); once we got into battle with multiple opponents we constantly had to keep moving to either attack them or take damage on a different flank if one shield was dropping. 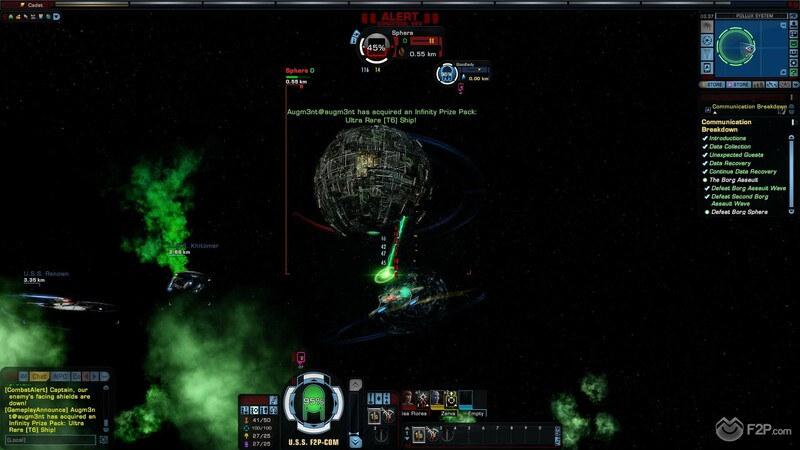 Whilst the early combat wasn’t too demanding, it felt chaotic (in a good way) and we can only imagine how insane battles must be in PVP against a large number of players working together with all different classes, ships and weapons, working together and constantly trying to reposition to outmanoeuvre their opponents. It would be exciting and capture Star Trek perfectly. The mission phase continued, the story leading into the next big story-arc, and what a story-arc it was! Perfect World have pulled out all the stops when it comes to creating something epic and even early on they’ve done with one of the biggest and baddest threats to the universe as being our initial enemy (again, we’ll keep the spoilers at bay). For us it was a big surprise to see them appear so early in the game and would generally have thought they’d be reserved for being a late game opponent, but being dropped in the middle of a confrontation with them was pretty awesome and had us whooping and cheering at the screen. This brought us to the end of our main play test and we wanted to put some time into checking out the game’s player created content feature: the Foundry. Here you can create your own levels, maps and quests, litter them with speaking NPCs, enemies, interactive items, and more; we played with the Foundry extensively in PWEs other MMORPG Neverwinter, so we were excited to see what we could do in Star Trek Online albeit it was an earlier version of the system. Unfortunately for us it would appear that unlike Neverwinter the Foundry creation tool isn’t a free to play element (playing Foundry content is free, but making it requires you to buy it) which was extremely disappointing. 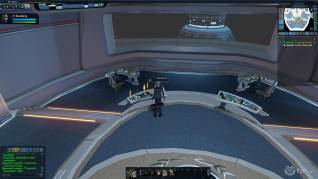 So what did we make of our experience in Star Trek Online? From a combat perspective there is a major contrast with space and ground, the ground being extremely weak from what we experienced and challenging in all the wrong ways; if it wasn’t for how epic space combat felt then we’d have written off the game. Graphically shaky in places this is made up for with the attention to detail to really build an environment, creating the world, the NPCs and their personalities, the dialogue, the character customization and the game’s plot itself… it feels very hand crafted, like the RPG element and story was the most important aspect to the game; and for Star Trek it absolutely should be. 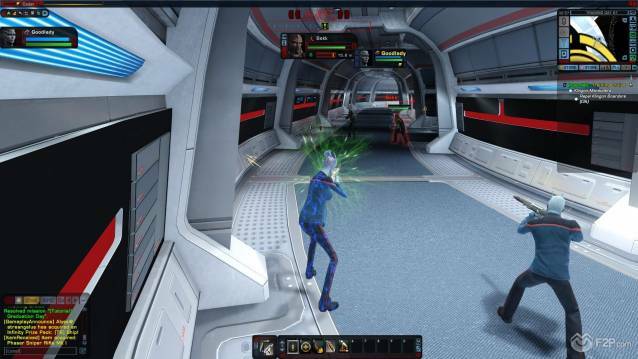 If you’re looking for a sci-fi MMORPG then there’s possibly better options out there, if you’re looking for the full Star Trek experience then STO definitely delivers it.